I’m going to work on this while it’s still somewhat fresh in my mind. Penelope is two weeks old, and life with a newborn is totally different and overwhelming at times. I definitely haven’t had much time for things other than baby. We are doing well, and there are good times where she naps for long periods of time, which is when I can do a few things. I always liked reading labor stories when I was pregnant, so I wanted to share hers for myself to remember and for anyone else who is interested. We went in to the hospital to begin my induction, since I was at 41 weeks 1 day and only 1 cm dilated. I was ready to get things moving and my doctor recommended the induction to make sure the placenta stayed healthy. We checked in and got all set up in our room and met the nurse who would be taking care of me for the night. I immediately rammed my knee into the side of the bed as soon as I tried to get in, so you could say it started off very well. Once I got in the bed, monitors were hooked up to my belly, so it was interesting to be able to see the contractions on the screen. They started with the foley bulb, which goes into the cervix and is blown up like a small balloon to help dilate the cervix. A doctor placed the foley bulb, and when she was done, I asked her if the bed was heated, because I was feeling really warm where I was lying. She looked puzzled and said no, then checked on things down there and found that she had accidentally broken my water. Oops, but it just meant that they would prefer me to have the baby in the next 12 hours or so. I waited in the bed (with about 12 layers of cloths under me to soak up the water) with Greg sitting in a chair beside me, holding my hand, and my nurse left to let things start moving. The contractions started getting stronger after about half an hour or so, and I began squeezing Greg’s hand through them, although they were still manageable. Greg actually fell asleep at some point, and I was squeezing his hand trying to wake him up, because I needed to pee and needed his help getting to the bathroom, but I had to say his name and poke him. I went pee and that’s when my foley bulb popped out. That was good news and meant the induction was working, so I called in the nurse and she started me on pitocin to get contractions going. I stayed on the pitocin working through contractions by squeezing Greg’s hand for the next couple hours, and made it to 3 or 4 cm before I asked for the epidural. The contractions were getting stronger at that point. I knew that I wanted an epidural before I came in, but I wanted to wait as long as I could hold off because I wouldn’t be able to walk around afterward. They placed the epidural, which was not nearly as bad as I expected. I sat up in the bed while it was placed and Greg sat right in front of me, holding my hands, and the doctor was very quick. After that, things got much better and I couldn’t feel the pain, just pressure, and I could still move my legs. I was checked on every hour or so to see how things were going and things got to where they needed to be for me to be able to push when I felt the urge. I was 10 cm dilated and baby was at zero station, meaning she was ready to go. My midwife had me try a few practice pushes, which went well, but I couldn’t feel too much. I still hadn’t made further progress or had a strong urge to push after a while, so she gave me two options: continue waiting to see how things go or stop the epidural to give me more feeling and increase the urge to push. I was really scared to stop the epidural, but I looked to Greg for support and we both agreed to stop it. That was definitely a turning point where things got more intense. I fully intended to do epidural all the way, so finishing it without meds was not in my plans. The contractions got stronger and stronger, and things are a little fuzzy in the timeline after that. I know sometime after that, I called my midwife back in because I wanted to try to push. I could be off on the timeline, because I was focusing on getting through each contraction, but I began pushing, which was really hard. That’s probably an understatement – it was the hardest thing I’ve done. My midwife was really great in guiding me through it, telling me exactly where to push and how to use the rest of my body doing it. To me, it felt like forever that I was pushing, but my family tells me it was a really short time. Greg thinks it was only about 20 mins, and my mom, who was also in the delivery room, thinks it was about an hour. I also ended up using the mirror, which I didn’t think I would want, but my midwife suggested it may help me to see her. I actually think it did help, since then I could see if I was making progress and actually see her head (full of hair). My mom told me afterward that I was just letting out small yells/screams, but I felt like I was screaming bloody murder. It was an intense experience, but I kept telling myself how badly I wanted her to come out, and Greg, my mom, and the midwife were all there giving me lots of support. Every contraction was extremely strong and painful at this point, but finally as one big contraction hit, I pushed as hard as I could (if you’ve ever seen Total Recall with that scene with their eyeballs about to burst out of their face, that’s I felt like! ), and Penelope was born, loud and screaming, into this world. After that, they immediately put her on my chest and she knew right away how to breastfeed. I held her for about an hour doing skin to skin, feeling totally exhausted and relieved and happy, and then they measured and weighed her. We have been trying to get used to living with a tiny person ever since. It’s definitely life-altering. Some days are hard, really hard, but other times are better. I haven’t had any time for reading blogs and it may take me a bit to get back into any routine, but I appreciate everyone who has been reading and/or thinking of us – all the comments have been really kind and I hope I can catch up again one day. I haven’t gotten to my computer much, but I’ve been reading comments on my phone and I appreciate them, even if it takes me a while to respond! 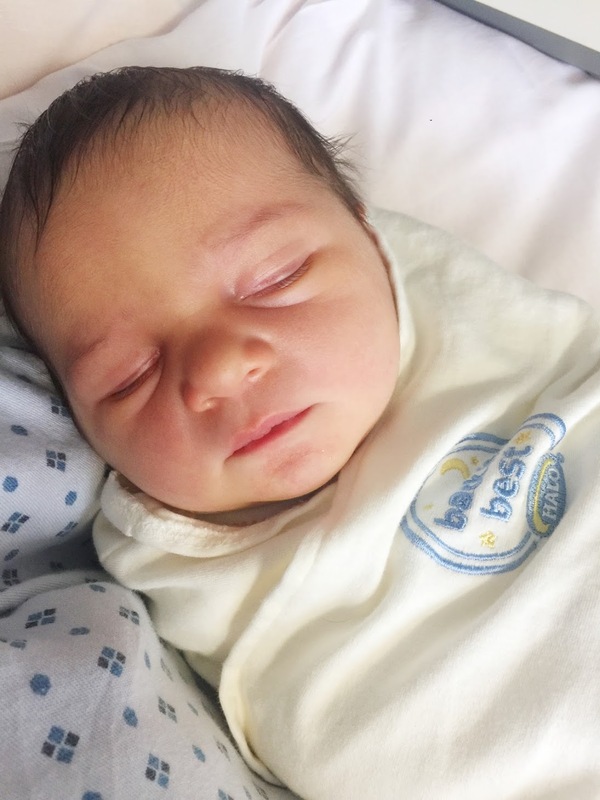 I am so glad you shared her birth story, I love reading them. Did the induction part hurt? I am hoping that baby girl comes on her own in a timely fashion but you can never plan any of it! Stopping the epidural would have scared me too, but look how strong you are!!! You should feel proud! Congrats pretty mama! I actually laughed out loud at my desk about the Total Recall comment. I know exactly what you're talking about. isn't it funny how the concept of time gets all messed up? When I was with my friend, she only pushed like 15 minutes -she thought it was an eternity. Glad that most of your labor, you were able to use the epidural. I'm sure that helped get your strength up with that final round of SUPER MOMMA pushing!!!! Heavens! Birth stories always half-fascinate me and half-freak me out. Yours is no different, lol! I'm just so terrified of the pain! You were so strong though and totally pushed through it for the sake of Penelope! (Adorable name, by the way!!) I'm impressed by all your timed recaps! Congratulations, friend! So happy for you! She is perfect and I love her name! Aren't epidurals the best?! I had no hesitations about getting one. Yay! I love reading birth stories. I have to say I'm pretty glad they didn't suggest turning off my epidural for pushing with Swede! Is there a story behind her name? It's so pretty.